GO ON Nutrition high-protein bar with vanillia-raspberry flavor. 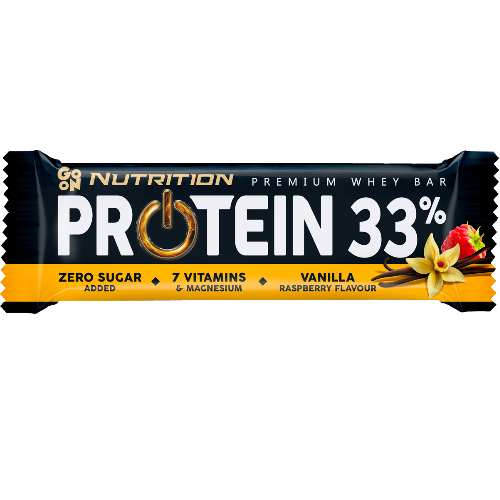 PROTEIN 33% high protein bar is a delicious vanillia-raspberry whipped bar topped with vanillia topping. It provides a good portion of protein and 7 vitamins, important for physically active people. The MPI milk protein isolate and the WPC 80 whey protein concentrate form a perfectly selected composition – as much as 33% of milk protein, which contributes to the growth and maintenance of muscle mass and healthy bones *. Magnesium contained in bars helps in maintaining electrolyte balance, proper muscle work and contributes to the reduction of tiredness and fatigue *. 34% milk proteins: milk protein isolate MPI, whey protein concentrate WPC 80 (from milk); soluble (corn) fiber, sweetener: maltitol; vegetable fats: palm, shea; peanuts, humectant: glycerol; soy isolate, lyophilized raspberry 1.5%, soluble fiber (acacia), tapioca starch, salt, flavors, sweeteners: sucralose, steviol glycosides; emulsifier: lecithins (from soy), enriching substances: magnesium citrate, vitamin C, niacin, vitamin E, pantothenic acid (B5), vitamin B6, thiamine (B1), vitamin B12. The product contains naturally occurring sugars.